Adipose tissue from lipoaspirate, an otherwise disposable byproduct of cosmetic surgery, is a less invasive source of stem cells with multipotent differentiation potential than bone marrow. Furthermore, lipoaspirate can be obtained in large quantities thus making it an attractive source of mesenchymal stem cells (MSCs) for a broad range of research applications. Stem cells are obtained from densely vascularized white adipose tissue (AT) or the stromal vascular fraction (SVF), which harbors large amounts of AT-MSCs (PMID: 16410387). Up to 300-fold more stem cells can be obtained from 100 g of adipose tissue compared to 100 mL of bone marrow aspirate (PMID: 14985162, 16698690). Lipoaspirate contains a population of stem cells termed adipose-derived stem cells or adventitial stromal cells (ADSC), as well as pericytes (PC). Both cell types share many similarities with MSCs from bone marrow, including multilineage differentiation capacity and immunomodulatory capacity (PMID: 12475952, Braun, J. 2013. Dissertation, TU Berlin). Cells in the adipose tissue-derived SVF can be separated into a CD45+ and a CD45– population. Three cell subsets can be identified within the CD45– population: adventitial stromal cells (ADSC), pericytes (PC), and endothelial cells (EC). Miltenyi Biotec has developed a dedicated protocol to prepare the stromal vascular fraction (SVF) from human lipoaspirate. Human thigh or abdomen lipoaspirate obtained from cosmetic surgeries is dissociated with collagenase and cells are pelleted by centrifugation. After resuspension in StemMACS™ MSC Expansion Medium, the cells are serially filtered through 100 µm and then 40 µm nylon filters to obtain a single-cell suspension from which MSCs can be isolated. 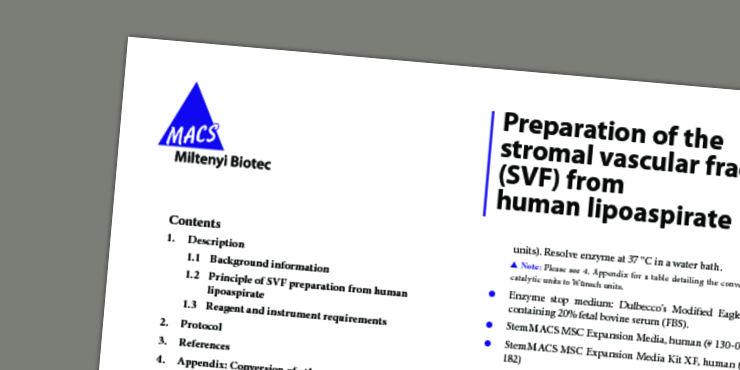 Preparation of the stromal vascular fraction (SVF) from human lipoaspirate.